Herod the Great, appointed ruler (ethnarch) of the Jews by the Romans in 40 BC, kept the peace in Palestine for 37 years. His ruthless control, coupled with genuine ability, has been recorded by the Jewish historian Josephus, who describes him as “a man of great barbarity towards everyone.” Though he identified himself publicly as a practicing Jew, Herod was an Idumaean (an Edomite), the son of Antipater the Idumaean, a high-ranking official under the Jewish ethnarch Hyrcanus II, the last legal Hasmonean rule of Judaea, whose daughter Herod married. Because he was not himself a Hasmonean and was not ethnically a Jew, Herod was continually in fear of losing his throne. It is not surprising that the Magi’s report of the birth of an infant King of the Jews (Matthew 2) caused him fear and anger. 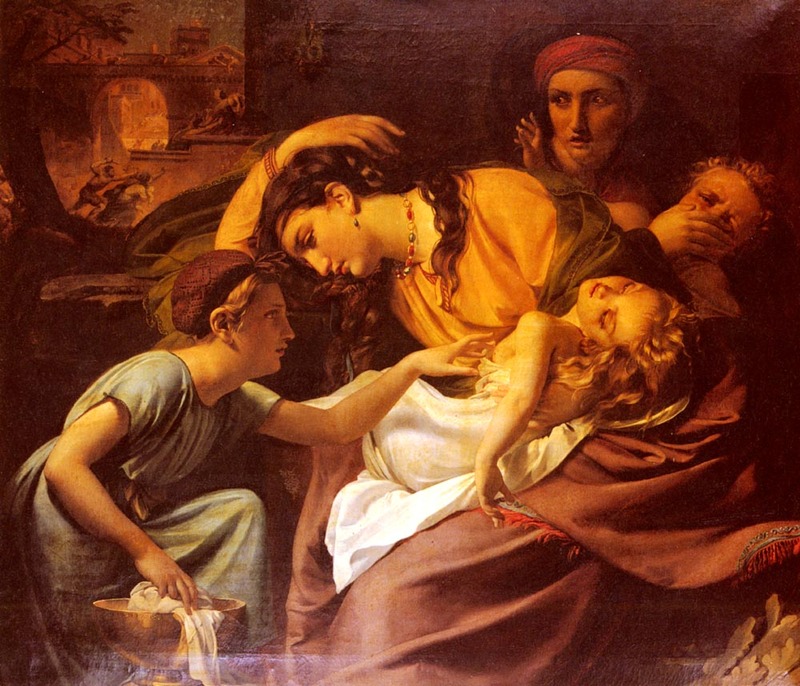 Although the event is not recorded in other sources, the story of the massacre of the Innocents is completely in keeping with what is known of Herod’s character. An icon of the Holy Innocents entitled, “The Lament of Rachel“, and the troparion for the day, may be viewed at the “Come and See” Icons website. John, the son of Zebedee, with his brother James, was called from being a fisherman to be a disciple and “fisher of men.” With Peter and James, he became one of the inner group of three disciples whom Jesus chose to be with him at the raising of Jairus’ daughter, at the Transfiguration, and in the garden of Gethsemane. John and his brother James are recorded in the Gospel as being so hotheaded and impetuous that Jesus nicknames them “Boanerges,” which means “sons of thunder.” They also appear ambitious, in that they sought seats of honor at Jesus’ right and left when he should come into his kingdom. Yet they were faithful companions who were willing, without knowing the cost, to share the cup Jesus was to drink. When the other disciples responded in anger to the audacity of the brothers in asking for this honor, Jesus explained that in his kingdom leadership and rule take the form of being a servant to all. If, as is traditionally held, John is to be identified with “the disciple whom Jesus loved,” then he clearly enjoyed a very special relationship with his Master, reclining close to Jesus at the Last Supper, receiving the care of his Mother at the cross, and being the first to understand the truth of the empty tomb. The Acts of the Apostles records John’s presence with the Apostle Peter on several occasions: the healing of the lame man at the Beautiful Gate of the Temple, before the Sanhedrin, in prison, and on the mission to Samaria to lay hands on the new converts that they might receive the Holy Spirit. According to tradition, John later went to Asia Minor and settled at Ephesus, where he had the care of Mary, the Mother of Jesus, until her death. Under the emperor Domitian, he was exiled to the island of Patmos, where he experienced the visions recounted in the Book of Revelation. Irenaeus, at the end of the second century, writes that Polycarp, bishop of the Church at Smyrna, recalled in his old age that he had known the apostle while growing up at Ephesus. It is probable that John died there. He alone of the Twelve is said to have lived to extreme old age and to have been spared a martyr’s death, though he suffered the martyrdom of exile. Very probably a Hellenistic Jew, Stephen was one of the “seven men of good standing, full of the Spirit and of wisdom” (Acts 6:3), who were chosen by the apostles to relieve them of the administrative burden of waiting on tables and caring for the widows. By this appointment to assist the apostles, Stephen, the first named of those whom the New Testament calls “the Seven”, became the first to do what the Church traditionally considers to be the work and ministry of a deacon. It is apparent from that Stephen’s ministry involved more than serving tables, for the Acts of the Apostles speaks of his preaching and performing many miracles. These activities led him into conflict with some of the Jews, who accused him of blasphemy, and brought him before the Sanhedrin. His powerful sermon before the Council is recorded in the seventh chapter of the Acts of the Apostles. His denunciations of the Sanhedrin and against the Temple so enraged the members of the council that, without a trial, they dragged him out of the city and stoned him to death. Saul, later called Paul, stood by, consenting to Stephen’s death, but Stephen’s example of steadfast faith in Jesus, and of intercession for his persecutors, was to find fruit in the mission and witness of the Apostle Paul after his conversion. A sermon by Fulgentius, a sixth century bishop of Ruspe, proclaims that Paul, helped by Stephen’s prayers, now rejoices with Stephen, delights in the glory of Christ with Stephen, exalts with Stephen, and reigns with Stephen. The priests and the prophets and all the people heard Jeremiah speaking these words in the house of the Lord. And when Jeremiah had finished speaking all that the Lord had commanded him to speak to all the people, then the priests and the prophets and all the people laid hold of him, saying, “You shall die! Why have you prophesied in the name of the Lord, saying, ‘This house shall be like Shiloh, and this city shall be desolate, without inhabitant’?” And all the people gathered around Jeremiah in the house of the Lord. Therefore I send you prophets and wise men and scribes, some of whom you will kill and crucify, and some you will flog in your synagogues and persecute from town to town, so that on you may come all the righteous blood shed on earth, from the blood of innocent Abel to the blood of Zechariah the son of Barachiah, whom you murdered between the sanctuary and the altar. Truly, I say to you, all these things will come upon this generation. The scripture texts for the Lessons and Gospel are taken from the English Standard Version Bible. The Collect and Psalm are taken from the Book of Common Prayer (1979). 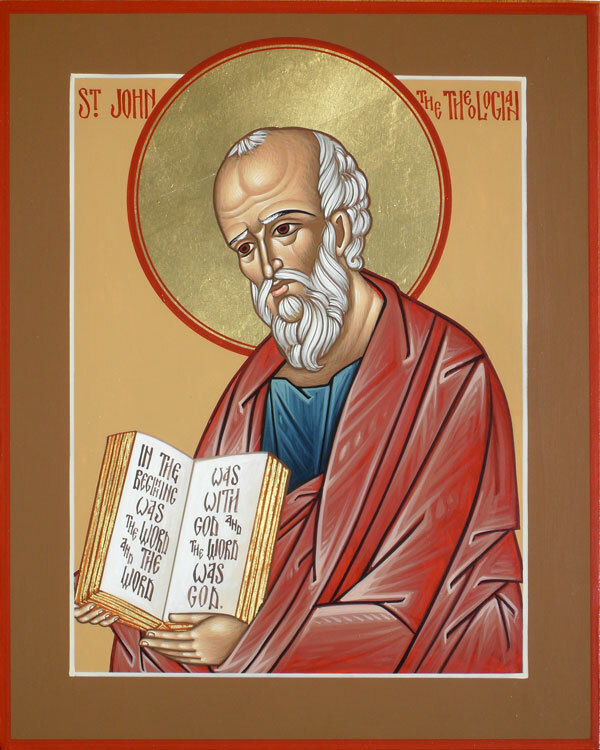 The Gospel according to John records several incidents in which the apostle Thomas appears, and from them we are able to gain some impression of the sort of man he was. When Jesus insisted on going to Judea, to visit his friends at Bethany, Thomas boldly declared, “Let us also go, that we may die with him” (John 11:16). At the Last Supper, he interrupted our Lord’s discourse with the question, “Lord, we do not know where you are going; how can we know the way?” (John 14:5). After Christ’s resurrection, Thomas would not accept the account of the other apostles and the women, until Jesus appeared before him, showing him his wounds. This drew from him the first explicit acknowledgment of Jesus’ deity, “My Lord and my God!” (John 20:28). Thomas appears to have been a thoughtful if rather literal-minded man, inclined to skepticism; but he was a staunch friend when his loyalty was once given. The expression “Doubting Thomas”, which has become established in English usage, is not fair to Thomas. He did not refuse belief. He wanted to believe, but he wanted to be certain that what the others had seen was not simply an apparition or a vision, that the one whom they had seen was actually the same crucified Jesus, that God had actually raised him from the dead. Thomas serves as a witness to the bodily resurrection of the Lord in a Gospel that bears witness to the Word made flesh. For this reason, Jesus gave him a sign, though Jesus had refused a sign to the Pharisees. And yet, the Lord’s rebuke: “Blessed are those who have not seen and yet believe” (John 20:29), demonstrates that the sign itself does not create faith, that faith would come by the hearing of the word of those who bore witness to the crucified and risen Jesus as Lord and Messiah. An early tradition noted by the fourth century bishop and historian Eusebius and others tells of Thomas’ evangelization of the Persians and of his missionary travels in India. The third century Acts of Thomas tell that he entered India as a carpenter (hence his being traditionally depicted with a carpenter’s square and rule), preached the Gospel, performed miracles, and died a martyr at Mylapore near Madras. One of the greatest of the early basilicas (fourth century) was the Church of St Thomas at Edessa, Syria, and his body is said to have been buried there, though the stories of his work in India claim his burial at St Thomas Mount near Madras. It is possible, though modern scholars think it unlikely, that Thomas reached India. The “Christians of St Thomas”, who live along the Malabar coast of southern India and are gathered into several different Churches of Syriac origin (including the Mar Thoma Church, in communion with the Churches of the Anglican Communion), claim spiritual descent from Thomas the Apostle. What is not disputed is that they were in India at least a thousand years prior to the arrival of European missionaries in the sixteenth century. The Eastern Churches have commemorated St Thomas since the sixth century, and the Roman observance dates from the ninth century. His feast day in the East is October 6, and the Roman Catholic Church has moved his commemoration out of Advent to July 3, the date of his commemoration in the Syrian Church. Everliving God, who strengthened your apostle Thomas with firm and certain faith in your Son’s resurrection: Grant us so perfectly and without doubt to believe in Jesus Christ, our Lord and our God, that our faith may never be found wanting in your sight; through him who lives and reigns with you and the Holy Spirit, one God, now and for ever. Amen. The scripture texts for the Lesson, Epistle, and Gospel are taken from the English Standard Version Bible. The Collect and Psalm are taken from the Book of Common Prayer (1979). The icon of Saint Thomas is taken from the website of the Holy Transfiguration Monastery. Andrew, whose name means “manly”, was the brother of Simon Peter and was born in Bethsaida, a village of Galilee. The Gospel according to John tells us that Andrew, a disciple of John the Baptist, was one of the two disciples who followed Jesus after John had declared of him, “Behold the Lamb of God” (John 1:29). Andrew and the other disciple followed Jesus, and Andrew’s first act afterward was to find his brother and bring him to Jesus. For this reason, Andrew is given the title “the First-Called” by the Eastern Churches. Though Andrew was not a part of the inner circle of disciples – Peter, James, and John, he is always named in the lists of the disciples. In Matthew and Luke, his name appears second, while in Mark and in the Acts of the Apostles he is listed after Peter, James, and John, as fourth in the list in company with Philip. 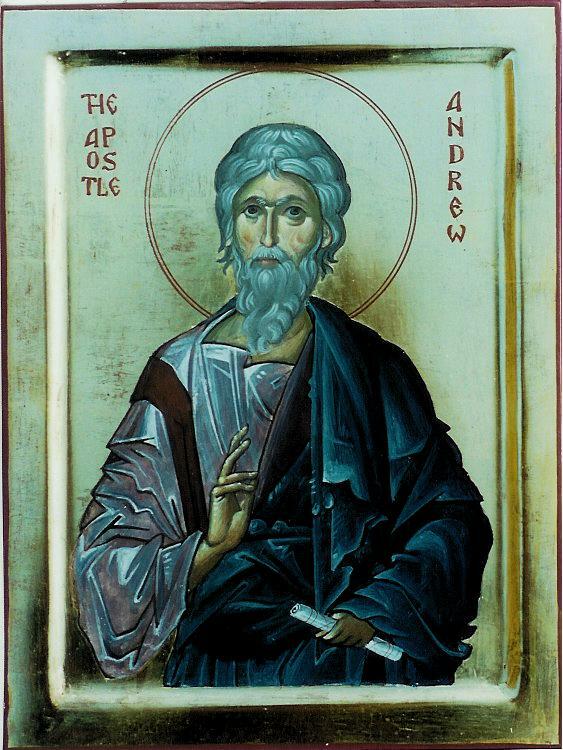 Andrew appears prominently in several incidents in the Gospels. Andrew and Peter were fishermen, and in the Gospel according to Matthew Jesus calls them from their occupation, and they immediately respond to his call. Andrew was the disciple who brought the boy with the loaves and the fishes to Jesus for the feeding of the multitude. The fourth century historian and bishop Eusebius writes that after Pentecost, Andrew preached in Scythia. Jerome and Theodoret locate his preaching in Greece (Achaia), and Nicephorus places him in Asia Minor and Thrace. The late second century Muratorian Fragment connects him with the writing of the Gospel according to John. A late tradition holds that he was martyred on November 30, c. 70 at Patras in Achaia. An ancient church still stands over the traditional site of his martyrdom. The earliest mention of his being crucified on an X-shaped (“Greek”) cross is from the tenth century. This tradition accounts for the X-shaped cross of St Andrew that appears in medieval and Renaissance iconography. St Andrew’s body is said to have been taken to the Church of the Holy Apostles in Constantinople in 357 and later translated to the cathedral in Amalfi, Italy. The patriarchate of Constantinople grounds its claim to be an apostolic see (like Antioch, Jerusalem, and Rome) on the tradition of his having been the first bishop of the Church at Byzantium, the older town which the emperor Constantine enlarged to found Constantinople. The Churches of Greece and Russia particularly give high honor to St Andrew, and because of a legend that certain of his relics were translated to St Andrew’s Church in Fife in the eighth century, he became a patron saint of Scotland (hence the appearance of the X-shaped Cross of St Andrew on the Scottish flag and on the British Union flag). The feast of St Andrew was observed as early as the fourth century in the East and by the sixth century at Rome. The feast day determines the beginning of the Church year, since the First Sunday in Advent is always the Sunday nearest to St Andrew’s Day, whether before or after. In most liturgical books the sanctoral calendar begins with the commemoration of St Andrew the Apostle. [Moses said to the people of Israel] For this commandment that I command you today is not too hard for you, neither is it far off. It is not in heaven, that you should say, “Who will ascend to heaven for us and bring it to us, that we may hear it and do it?” Neither is it beyond the sea, that you should say, “Who will go over the sea for us and bring it to us, that we may hear it and do it?” But the word is very near you. It is in your mouth and in your heart, so that you can do it. The icon of Saint Andrew the Apostle was written by and is © Aidan Hart and is reproduced here with his generous permission. Apart from their inclusion in the apostolic lists of the Twelve in the Synoptic Gospels and the Acts of the Apostles, nothing more is known from the Scriptures about the apostles Simon and Jude. As with many of the Twelve, their names are recorded, but the details of their work after Pentecost is not given. We are simply given to know that they, along with the rest of the apostolic band, are the foundation on which the Church is built, Jesus Christ being the chief cornerstone. Simon, sometimes given the epithet “the Less” to distinguish him from Simon Peter, is known in the Gospels either as Simon the Canaanite or Simon the Zealot. The latter may mean simply that he was zealous in keeping the Law, or that he was a member of the Zealot party, fanatical opponents of Roman rule in Judaea and Galilee. The Monology of Basil the Great tells us that Simon died a peaceful death at Edessa, but Western tradition, as represented by the Roman Martyrology and dating back to the sixth century, holds that he first preached in Egypt and then joined Jude (who had been in Mesopotamia), and that together they went to preach the Gospel in Persia, where they suffered martyrdom at Sufian (or at Siani). Jude, called “Judas not Iscariot” in John’s Gospel, is referred to in Luke as “Judas of James”. In more modern translations, this is taken to mean “son of James”, but older translations (such as the Authorized Version) render it “brother of James”, so that in the West at least, Jude has traditionally been understood to have been the brother of James, the brother of the Lord (and thus the brother, step-brother, or cousin of Jesus – see Matthew 13 and Mark 6). (If so, this would make Jude the first of Jesus’ brothers known to have become one of his followers.) He is also traditionally held to be the author of the Epistle of Jude. Jude is also generally understood to be the same person as Thaddaeus (or Lebbaeus) in the Gospels according to Matthew and Mark, names perhaps given to him to distinguish him from Judas Iscariot. In the West, following the tradition of the apocryphal Passion of Simon and Jude, the two have been commemorated together in the calendar, on the twenty-eighth of October. The Armenian Church regards Saint Thaddaeus and Saint Bartholomew as the first to preach the Gospel among the Armenians and so commemorate those two apostles together. In the Orthodox Churches, Saint Simon and Saint Jude (“the brother of the Lord”) are commemorated separately. The relics of Saint Simon and Saint Jude are held to have been translated to Saint Peter’s in Rome in the seventh or eighth century. There are at least three ancient dedications of English churches to Saint Simon and Saint Jude together, but none to either of them alone. [Jesus said to his disciples] “These things I command you, so that you will love one another. 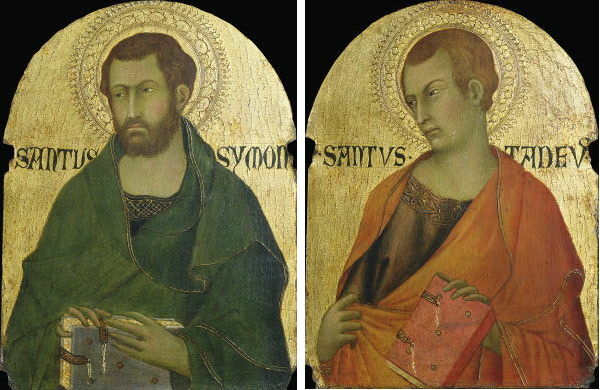 The icons of Saint Simon and Saint Jude are from the workshop of Simone Martini, c. 1320. My thanks to the website of Christ Church, Windsor, Nova Scotia, for the image. The Collect and Psalm are taken from the Book of Common Prayer (1979). The Lesson, Epistle, and Gospel are taken from the English Standard Version Bible. In Matthew 13 and Mark 6, James is listed first among the brothers of Jesus: James, Joseph, Simon, and Judas. The Apostle Paul writes in Galatians 1 that he met James, “the Lord’s brother”, at Jerusalem on his first visit to the city after becoming a follower of Jesus Christ. From the second century, there has been some uncertainty about the exact relationship between Jesus and his brothers. In the second century, Epiphanius suggested that the “brothers” were sons of Joseph by a former marriage (Joseph being a widower at his marriage to Mary), which remains the view of the Eastern Church. 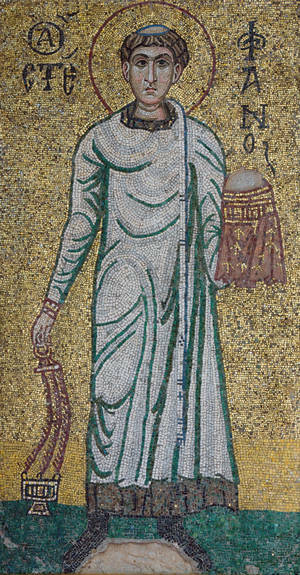 Helvidius, a fourth century writer who opposed belief in the perpetual virginity of Mary, the mother of Jesus, claiming the support of Tertullian wrote that Jesus was Mary’s first child and that the brothers (and sisters) noted in the Gospels were children of Mary and Joseph, born after Jesus. In response to Helvidius, Saint Jerome stated that the “brothers and sisters” of Jesus were either older children of Joseph’s former marriage, and thus step-siblings of the Lord (following Epiphanius), or that they were actually the children of the Virgin Mary’s sister, and thus Jesus’ cousins (the word in the Gospels translated “brothers” can also be used of cousins). Jerome’s view prevailed in the West until most post-Reformation Protestants and Anglicans adopted Helvidius’ view. Whatever his relationship to Jesus – younger brother, older step-brother, or cousin – James became a follower of Jesus after the Resurrection, when Jesus appeared specially to him. From early on, James was recognized as a leader in the church at Jerusalem. Although not one of the Twelve, he was regarded as an apostle (see Galatians 1). Saint Paul recognized James, along with the apostles Peter and John, as pillars of the church at Jerusalem. During the council of Jerusalem (Acts 15), which resolved the deeply divisive issue of whether Gentile converts should be circumcized before baptism, James defended the position argued by Paul and Barnabas against requiring circumcision and summarized the council’s decision: “Therefore my judgment is that we should not trouble those of the Gentiles who turn to God”, thus establishing the Church’s policy toward Gentile converts from that time forward. The fourth century historian Eusebius, quoting from an earlier church history by Hegesippus, writes that James was surnamed “the Just” (the Righteous) on account of his great piety and ascetical life. He went frequently into the Temple alone to pray and knelt so often, interceding for the forgiveness of the people, that his knees became as callused as a camel’s. Eusebius recounts that James was so persuasive in leading people to faith in Jesus that the scribes and Pharisees entreated him to “restrain the people, who are led astray after Jesus, as if he were the Messiah.” Refusing to do so, James was then thrown from the pinnacle of the Temple, where he had been placed to denounce Jesus to the people, and once he was upon the pavement was cudgeled to death. Toward the end of the first century, the Jewish historian Josephus recounted that James “with certain others” was stoned to death in the year 62 at the instigation of the high priest Annas. Then it seemed good to the apostles and the elders, with the whole church, to choose men from among them and send them to Antioch with Paul and Barnabas. Coming to his hometown he taught them in their synagogue, so that they were astonished, and said, “Where did this man get this wisdom and these mighty works? Is not this the carpenter’s son? Is not his mother called Mary? And are not his brothers James and Joseph and Simon and Judas? And are not all his sisters with us? Where then did this man get all these things?” And they took offense at him. But Jesus said to them, “A prophet is not without honor except in his hometown and in his own household.” And he did not do many mighty works there, because of their unbelief. 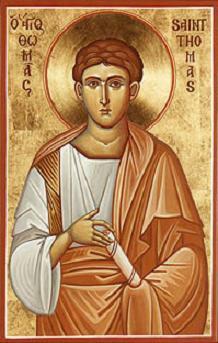 Saint James of Jerusalem is commemorated by the Eastern Churches and by several Anglican Churches on October 23. 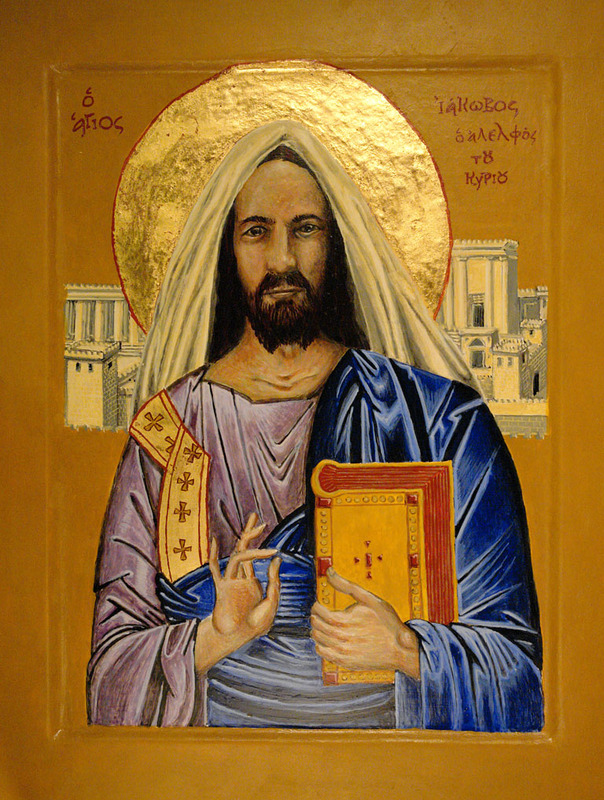 The icon of Saint James of Jerusalem was written by Tobias Stanislas Haller, BSG and is reproduced here with his generous permission.